Editor’s note: We are pleased to welcome Philip Leigh, who brings us a guest post on how the Civil War and Reconstruction shaped the south. 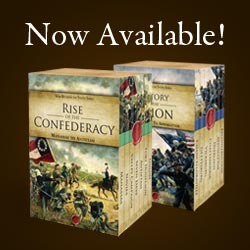 Be sure to check out his newest book, Lee’s Lost Dispatch and Other Civil War Controversies. Over the past fifty years, historians reinterpreted Civil War Reconstruction. Shortly before the Centennial it was generally agreed the chief aim of the Republican-dominated congress was to ensure lasting party control of the federal government by creating a reliable voting bloc in the South for which improved racial status among blacks was a coupled, but secondary, objective. However, by the Sesquicentennial it had become the accepted view that Republicans were primarily driven by an enlightened drive for racial equality untainted by anything more than negligible self interest. Consequently the presently dominant race-centric focus on Reconstruction minimizes political and economic aspects. Contrary to popular belief Southern poverty has been a longer-lasting Civil War legacy than has Jim Crow or segregation. Prior to the war the South had a bimodal wealth distribution with concentrations at the poles. The classic planters with fifty or more slaves had prosperous estates but they represented less than 1% of Southern families. Partly because 1860 slave property values represented 48% of Southern wealth, seven of the ten states with the highest per capita wealth soon joined the Confederacy. However, since two thirds of Southern families did not own slaves the 1860, per capita income of the region was only slightly ahead of the north central states and well behind the average northeastern state. A century later eight of the bottom ten states in per capita income were former members of the Confederacy. Even 151 years later only one Southern state, Virginia, ranked within the top ten in per capita income. Moreover, five (half) of the bottom ten in 2011 were former Confederate states. The classic example is Mississippi, which ranked number one in 1860 per capita wealth, but was dead last at fiftieth in 2011 per capita income. The depths of post Civil War Southern poverty and its duration were far greater, longer, and more multiracial than is commonly understood. It took eighty-five years for the South’s per capita income to regain the below average percentile ranking it held in 1860. The war had destroyed two-thirds of Southern railroads and two-thirds of the region’s livestock was gone. Steamboats had nearly disappeared from the rivers. One hundred million dollars in insurance investments and twice that amount in bank capital had vanished. Excluding the 100% loss in the value of slaves resulting from emancipation, assessed property values at the end of the war were more than 40% lower than in 1860. Approximately a 300,000 white Southern males in the prime of adulthood died during the war and perhaps another 200,000 were incapacitated, representing about 18% of the region’s approximate 2.75 million white males of all ages in 1860 and about 36% of those over age nineteen. During the war, Southern farms drifted back to nature. Since their protective levees had been destroyed, thousands of square miles of Mississippi delta cotton lands were overrun with briers and cane thickets. Returning Confederate soldiers often found their families existing in starving conditions. In December 1865 an estimated half-million whites in three Gulf states alone were without life’s necessities, and some had starved to death. When there was a shortage of work stock, the few surviving animals were passed from neighbor to neighbor. [When] there was no work stock [the men] hitched themselves to the plow. By ingenuity, backbreaking toil, and cruel self-denial thousands of Southern farmers survived reconstruction…They received no aid from any source, nor any sympathy outside the region. By 1870, Southern bank capital totaled only $17 million, compared to $61 million in 1860. So great was the devastation and anemic the rebound that by 1900 the South had barely recovered to the level of economic activity prior to the Civil War. Although Southern poverty and cotton culture is commonly associated with blacks, in 1940 two-thirds of Southern tenant farmers were whites. Shortly after the Great Depression began, the president of General Motors (Alfred P. Sloan) voluntarily cut his annual salary from $500,000 to $340,000. His $160,000 cut was more than all the income taxes paid by the two million residents of Mississippi that year. Post-war politics and federal economic policies impeded Southern economic recovery. Among such factors were property confiscations, Republican Party self-interest, discriminatory federal budgets, protective tariffs, banking regulations, and lax monopoly regulation. When Lee surrendered to Grant, more than two million fungible cotton bales were scattered across the South. Given an average price of 43 cents per pound, each bale was worth about $172, putting the value of the entire inventory at nearly $345 million as compared to perhaps $15 million of US currency then circulating in the region. The cotton might have been a resource to prime the pump of Southern recovery, but instead it was plundered. Southern lands were confiscated for non-payment of taxes, which were some of the highest in relation to wealth in US history. At one point 15% of Mississippi’s taxable land was up for sale due to tax defaults. When the Civil War ended the Republican Party was barely ten years old. Its leaders worried that it might be strangled in its cradle if the re-admittance of Southern states into the Union failed to be managed in a manner that would prevent Southerners from allying with Northern Democrats to regain control of the federal government. If all former Confederate states were admitted to the 39th Congress in December 1865 and each added member was a Democrat, the Republican majority in the Senate would have dropped from 40-to-10 to 40-to-32. Even more significantly, the Democrats would have seized a 143-to-111 majority in the House of Representatives versus an extant Republican majority of 111-to-72. The infant GOP needed to insure that most of the new Southern senators and congressmen be re-admitted as Republicans. That meant that vassal governments needed to be established in the Southern states. Since there were few white Republicans in the region the Party needed to create a new constituency. Consequently, Republicans settled on two objectives. First was mandatory African-American suffrage in all former Confederate states. They expected that such a mostly illiterate and inexperienced electorate could be manipulated to consistently support Republican interests out of gratitude for emancipation and voter suffrage. Second was to disenfranchise the Southern white classes most likely to oppose Republican policies. 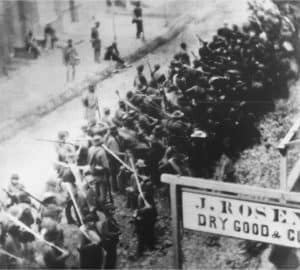 When the Civil War began, African-Americans were not permitted to vote in sixteen of the twenty-two Union-loyal states. In most of the remaining six they could only vote by meeting property and education tests that were more stringent than those applied to whites. Upon the war’s conclusion, only five New England states with tiny black populations permitted blacks to vote. Since the Constitution specified that voter qualifications were a matter of states’ rights, Republicans settled on a strategy that materialized as the Fourteenth Amendment, which had two key provisions. First, states refusing suffrage to male citizens of any race would have their congressional representation cut by subtracting the number of members of the excluded race from the applicable state’s population for purposes of calculating its House representation and electoral votes. Due to their tiny black populations, the provision was inconsequential in Northern states. Second, despite the fact that Congress considered their governments unlawful, all Southern states would be required to ratify the amendment before they could be readmitted into the Union. Republicans were anxious to get Southern states re-admitted as puppet regimes quickly because of the approaching presidential election. Through various acts congress disenfranchised enough Southern whites to enable the Fourteenth Amendment to be approved by a sufficient number of Southern Republican states for it to be ratified in July 1868 thereby assuring a large block of electoral votes for the party’s presidential candidate, Ulysses Grant, who would have lost the popular vote without 450,000 black Southern voters. Since six of the readmitted Southern states voted for Grant in 1868 and only two voted against him, it soon became apparent that a second amendment granting black men the vote in every state could be quickly approved. As a result, the Fifteenth Amendment was ratified by three-fourths of the states in 1870, less than a year after Grant took office. During Reconstruction Southerners were required to pay their share of federal taxes for sizable budget items that if funded by an independent defeated foe would have constituted reparations. To be sure, reparations are not a rare form of a victor’s compensation, but it should not be assumed that the Southern states escaped equivalent penalties merely because they were readmitted to the Union. 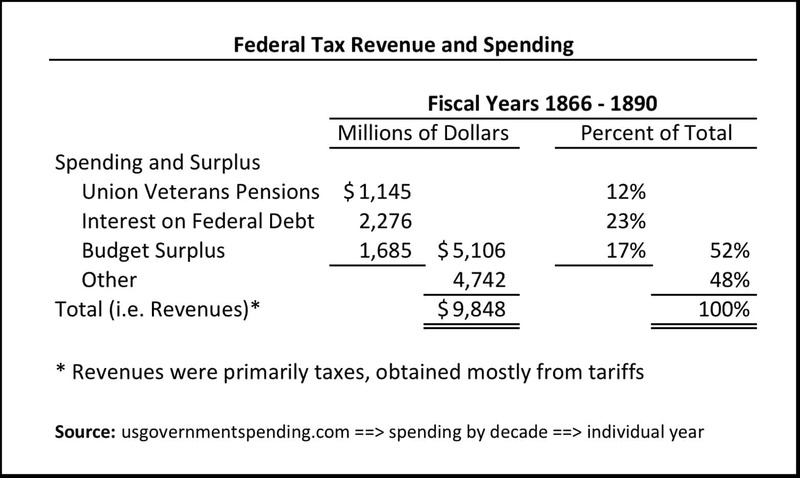 The table below summarizes federal tax revenues and spending for a quarter century following the Civil War. More than half of federal tax revenues were applied to three items: (1) federal debt interest, (2) budget surpluses, and (3) Union veterans benefits. Although compelled to pay their share of taxes to fund them, former Confederates derived no benefit from the allocations. Post-war surpluses were mostly used to retire the federal debt owed to Northerners who bought bonds sold during the Civil War when the federal debt jumped more than forty-fold from $65 million to nearly $2.7 billion. Similarly, Northerners received the interest payments on such debt, which accounted for 23% of federal revenues for a quarter century after the war. The budget surpluses were caused by protective tariffs that generated more income than necessary to operate the federal government. 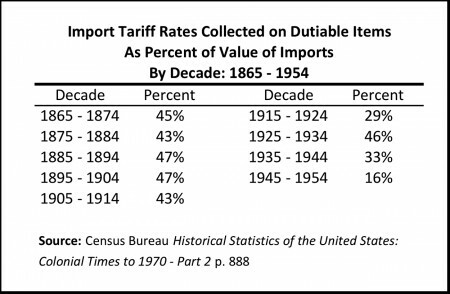 As the table below documents dutiable items were taxed at about 45% until after President Woodrow Wilson was inaugurated in 1913 and remained generally high until after World War II when the manufacturing economies of the Northern states had no international competitors because of the war’s destruction of European and Asian economies. The purpose of such tariffs was to restrict competition for domestic producers, almost none of which were in the South. The South’s was primarily an export economy. Even as late as the 1930s, 60% of its cotton was sold overseas. But foreign buyers could not pay for Southern cotton unless they could generate exchange credits by selling manufactured goods to Americans, which protective tariffs restricted. Finally, former Confederates derived no benefit from generous federal spending on Union veteran pensions. Ex-Rebel soldiers could only collect much smaller pensions from their respective states. Union veteran pensions were originally paid only to soldiers who sustained disabling injuries during military service, but Republicans gradually expanded eligibility to solidify veterans as a Party constituency. In 1878 the military-connected disability requirement was waived for widows. In 1890 pensions were available to all disabled veterans even if the disabilities resulted from post war civilian activities. In 1904 any Union veteran over age 62 was regarded as disabled and entitled to a pension. In 1876 Union veterans pensions represented 10% of the federal budget but the fraction climbed to 25% in 1886 and reached 40% in 1900. While some federal spending items not specified above benefitted the South, they were few, tiny, or funded by the Southerners themselves. From 1865 – 1873 the federal government spent $103 million on public works, but less than 10% went to the former Confederate states. New York and Massachusetts alone got more than twice as much as the entire South. Instead the federal government taxed cotton. As prices dropped after the war the levy represented about one-fifth of the market value. It raised $68 million, which was about seven times the amount of public works spending in the South from 1865 to 1873. The tax could not be passed along to buyers since most American cotton was exported where it had to compete with cotton from other countries that had no such tax. While the Freedmen’s Bureau provided some economic assistance, it was mostly devoted to the ex-slaves. Moreover, the cotton tax alone amounted to nearly three times the federal spending on the Bureau during the Bureau’s entire existence. To clarify how post Civil War banking regulations restrained post war Southern economic recovery it should be understood that for fifteen years prior to the war the federal government could stamp coins (mostly in specie of gold or silver) but was prohibited from printing paper money. The only paper currency then circulating were the banknotes of independent banks, which merited little value if they could not be redeemed for specie. The wheels of commerce required the circulation of such banknotes or specie. Enormous financing induced by the Civil War compelled monetary changes. The first was the 1862 Legal Tender Act, which paved the way for the 1863 National Banking Act. The first act authorized the federal government to print paper money without gold backing and the second forced national banks to become regular buyers of federal bonds, which were used to finance the war. Independent banks were nearly driven out of existence by placing a 10% tax on their banknotes. Although the post Civil War South badly needed rebuilding capital it was almost impossible for regional investors to organize suitable banks. First, national bank capital requirements were beyond the means of impoverished Southerners. Second, national banks could not make mortgage loans, a type of loan essential to the agrarian South. Third, national banks were prohibited from operating more than a single branch, which was a handicap in the sparsely populated South. Fourth, even though state chartered banks might offer mortgages and/or require less start-up capital, the 10% federal tax on their banknotes burdened them with prohibitive operating costs. Although the currently popular Reconstruction narrative portrays Southern Democrats as conservative, if not reactionary, the label is often erroneous when matters of economics, instead of race, are studied. When Republicans the lost Presidency from 1913 to 1921 to Democrat Woodrow Wilson, the former Southerner promoted a wave of progressive legislation. Although the Sixteenth (Income Tax) Amendment was passed shortly before Wilson took office, four years later it became graduated in order to minimize the burden on lower income taxpayers. Southerners had long supported the tax as an alternate revenue source that would enable tariffs to be cut. 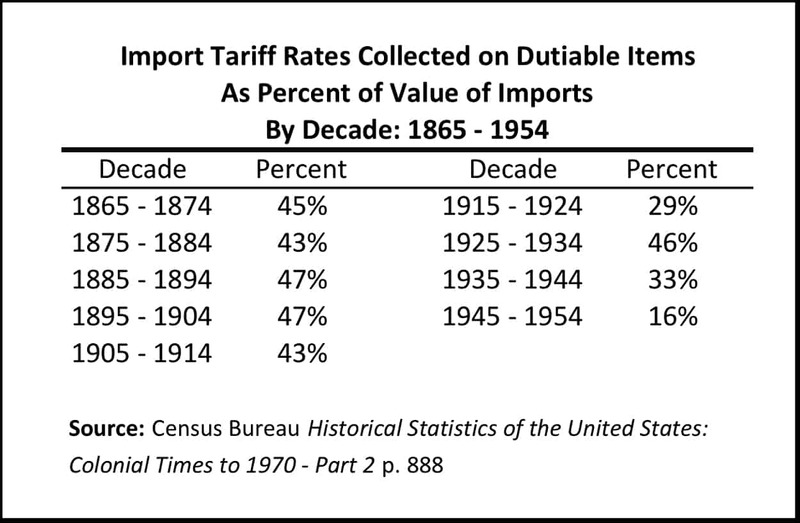 Consequently, tariffs were reduced to 27% during Wilson’s eight years as compared to 48% in the eight preceding years and 38% in the eight following years. Also under Wilson the long-sought Southern goal of banking reform materialized when the Federal Reserve System was created. The 1916 Federal Farm Loan Act and Warehouse Act were outgrowths of a sub-treasury plan advocated by Southerners twenty-five years earlier. Another example of Southern progressivism was monopoly regulation. After former Confederate Postmaster General John Regan became a US Congressman in 1875, he was one of the first advocates of railroad rate regulation, which led to formation of the Interstate Commerce Commission. The South was saddled with discriminatory railroad rates that took decades to rectify. Even as late as the 1940s Georgia Governor Ellis Arnell led a fight against “the freight-rate cartel” that hindered Southern economic development. Finally, in 1945, the ICC reduced “class-freight rates” 10% in the South and West and increased them 10% in the North and East. It was a tardy start at dismantling a persistent obstacle to Southern economic progress. Southerners constantly opposed protective tariffs, which were the root cause of monopolies. In 1899 the President of New York based American Sugar Refining conceded, “The mother of all trusts is the customs tariff bill.” By 1907 his company controlled 98% the country’s sugar processing capacity and it was the city’s most profitable manufacturing business. Its most popular brand, Domino Sugar, remains familiar today. While it is appropriate that Reconstruction history include a thorough analysis of racism and its protracted effects, contemporary historians give far less attention to numerous political and economic aspects, even though such factors are equally important. 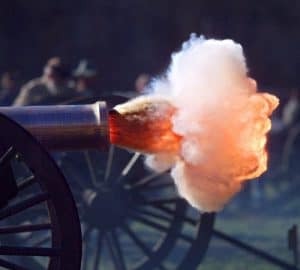 Phil has lectured a various Civil War forums, including the 23rd Annual Sarasota Conference of the Civil War Education Association and various Civil War Roundtables. He holds a Bachelor of Science in Electrical Engineering from Florida Institute of Technology and an MBA from Northwestern University.